When many of us parents hear the words “Oregon Trail” (especially those of us who were in elementary school in the mid to late 80s), we immediately think of the text-and-minimal-graphics computer game we played on the Apple IIe at school. Remember buying your supplies, heading out on the trail, trying to shoot animals, and hoping no one would die? I’m not sure if I ever made it to Oregon in that game. I think I typically either killed off my characters, got bored or ran out of time before I could “win” by making it to the end of the trail. Since I somehow missed out on having any pre-Civil War American History in school, my knowledge of the Oregon Trail pretty much started and ended with that game. 🙂 For our current US History unit (1815-1860, with a focus on the pioneers), I knew I wanted a book that would take us in depth on the subject. Miss M read a few non-fiction selections, and I chose Bound for Oregon by Jean Van Leeuwen as a bedtime read-aloud. Bound for Oregon is a story told as a first-person narrative of Mary Ellen Todd, a 1o year old girl who makes the journey with her family along the Oregon Trail in 1852. Mary Ellen and her family make new friends and part with them again, deal with sickness, difficult river crossings, trouble with their animals, unfriendly Indians, bad weather and difficult terrain — all the typical challenges and hardships that most pioneering families face as they journeyed thousands of miles across the plains and mountains on their way to Oregon and California. Miss M and I definitely found this book interesting, though I didn’t think it had some of the same compelling qualities that some of our other read-alouds have had this year. While hardship and even death (of friends the Todds meet along the way) are present in the story, there was little doubt in my mind of what was going to happen in the end. I just “knew” that this story would end up happily with the Todd family arriving in Oregon (without having to read the last chapter first or at least early…something I’ve actually done with some books!). In some ways I guess that makes this book more “educational” about what life was like on the trail for average pioneers who made the journey successfully. As I read this book I would have guessed that Mary Ellen and her family were a neat conglomeration of average families on the Oregon Trail created for this book. So I was a bit surprised to learn in reading the author’s note at the end of the book that Bound for Oregon is based on a true story — recollections that Mary Ellen shared with her children and grandchildren that were eventually written down and preserved. In the end I would say that Bound for Oregon fit a nice spot in our historical fiction read-aloud list for the year, but it’s not one that I would say is a must-read. It seems like I read or hear criticisms of Pinterest all the time: It’s a big time waster. It’s full of people idolizing beautiful houses and clothes. It makes people feel inadequate because they don’t have a “Pinterest Perfect” life. It’s too “busy” and visually cluttered. Well, that last criticism might be true. If you don’t find looking at pictures to be helpful way to organize and retrieve information, Pinterest may not be for you. But if you can see past pin after pin of someone’s idea of a dream house, you can turn Pinterest into a tool that works for you. I’ve really enjoyed using Pinterest to organize recipes, homeschool ideas, and more. 2. Browsing aimlessly through what friends or random strangers pin is not the useful thing about Pinterest — that’s the time waster. What’s useful is what you pin to your own boards. So, make yourself some boards that make sense to you. The board ideas Pinterest gives you when you join are kind of lame. Make boards instead for your hobbies, holidays, types of food you like to cook, homeschool subjects or other responsibilities you have. 3. Grab a “pin it” button, and “Pin” things you want to find again — helpful blog posts, recipes you run across, products you want to remember for a future holiday, and so on. You don’t just have to “repin” what other people have already pinned! 5. Don’t just follow all your facebook friends. (And don’t follow the people Pinterest “suggests” when you sign up — they probably won’t be pinning things you are specifically interested in). Really, you could not follow anyone at all on Pinterest, and just use it for your own personal bookmarking and organizational purposes. You’ll get the most out of following people on Pinterest if you follow people who have similar interests to your own — so look to follow the bloggers you already read, real-life friends whom you actually share things in common with (not that random person you are friends with on Facebook that you really only met once at a neighborhood coffee shop). 6. Also, as you repin those pins you find from specific searches, look at the boards you are finding those pins on — when you find a great pin from an interesting board, follow that board or all of that pinners boards. Don’t forget you can follow someone’s boards individually…or if you want to follow most, but not all of someone’s boards, you can click “follow” and then “unfollow” one or two boards if there are just a few you don’t find interesting. 7. 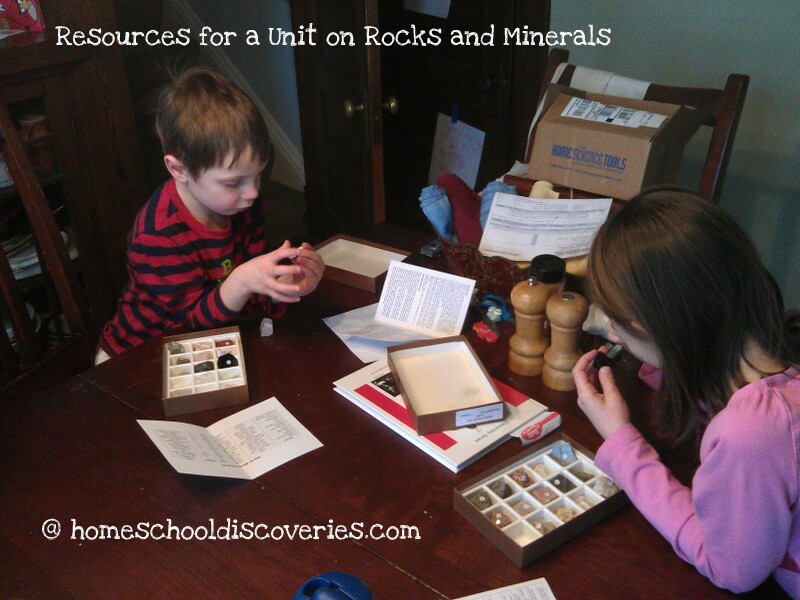 If you’re a homeschooler and you want to follow other homeschoolers to get ideas, check out the Homeschoolers on Pinterest linkup. Over 600 homeschoolers have linked their Pinterest profiles on that page! 8. Use Pinterest to collaborate. Did you know that you can invite other Pinterest members to pin on a board and make it a “group” board? 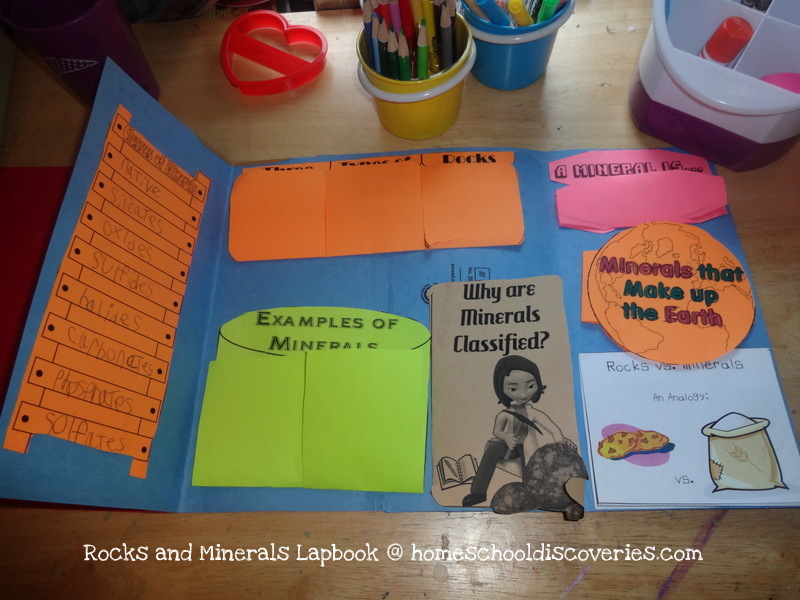 Whether you want to collaborate with other users of a homeschool curriculum or other members of a committee you’re a member of, you can create boards that others can add their “finds” to as well. Just remember that to add someone to your board, you need to be following at least one of their boards too. 9. Don’t forget to write helpful descriptions for your pins. Not only will this help you later as you are trying to find that recipe or lesson plan idea (in case you forgot what the picture looked like or the picture wasn’t very helpful), but it will make it easier for others who want to repin your pin. On Monday, Tony had off for President’s Day. The kids were excited to finally take Daddy with us to The Works (a small science/engineering museum), followed by a special family dinner out to a Chinese buffet restaurant. 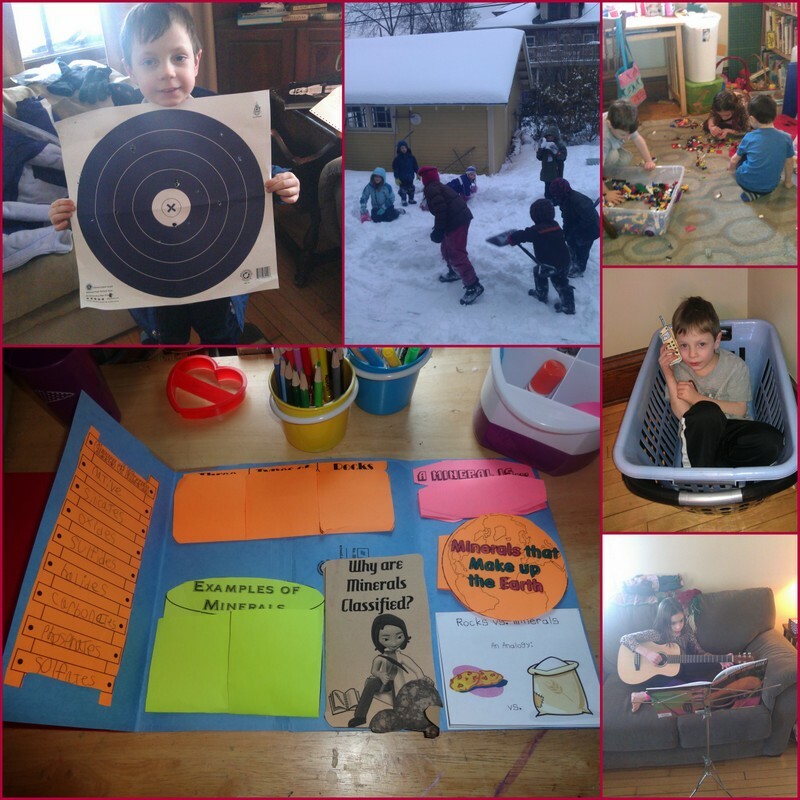 Tuesday, the kids enjoyed a relaxed morning playing at home, followed by a long-requested trip to Homeschool Open Gym at the Gymnastics gym the kids had a class at in the fall. Mr. K is finally old enough to participate, so I think we’ll be going more often the rest of this spring. My mom came for a visit on Wednesday. She is planning to take each of the kids out in turn on special outings. Miss M picked a shopping trip with Grandma a couple weeks ago. This week was Mr. E’s turn, and he picked a trip to an indoor Archery range! Then Thursday and Friday it was back to business as usual. It went better than I expected for only having a two-day school week. Miss M started the Division chapter in Math Mammoth 3B, and Mr. E did lessons from Right Start B on greater than/less than and Subtraction. We also read aloud from Life of Fred Apples. Only two chapters left! Mr E did two lessons of Logic of English Foundations, and Miss M wrapped up List #26 in Logic of English Essentials. Spreading a spelling lesson over two weeks was not good for Miss M however, and she did much more poorly than usual. We continued readings for US History focusing on 1815-1860, especially the pioneers. Miss M read “Sarah, Plain and Tall” and started the sequel, “Skylark“. 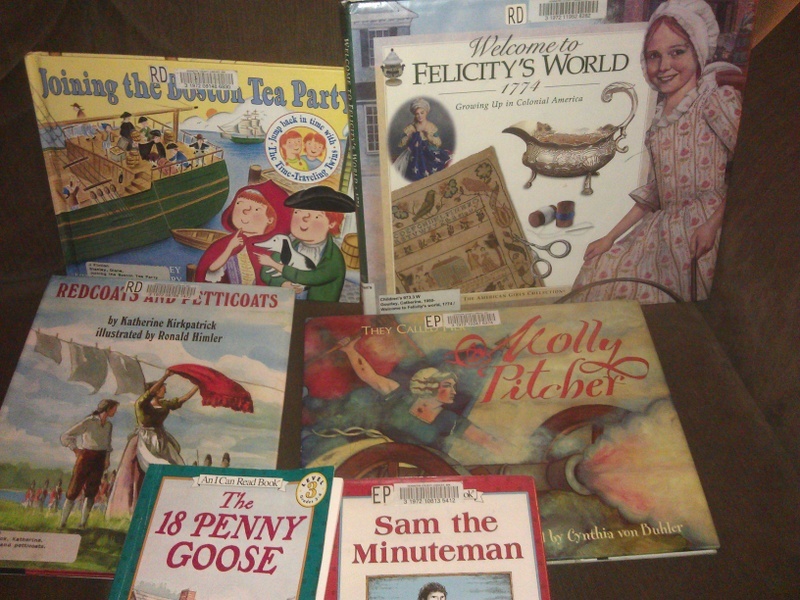 We also started “Bound for Oregon” as a bedtime read aloud and “A Pioneer Sampler” for daytime history reading. More snow! An additional almost six inches of snow brought the neighbor kids out to our backyard for snow fort building in the late afternoon on Friday. Seven kids worked together to make a huge fort! Mr. E in a basket…with a paper phone?!? All the kids ran around with paper phones pretending to talk on them and “install apps.” Who knew paper phones could be so much fun? Miss M practicing her guitar. She is continuing to enjoy lessons and improve steadily! 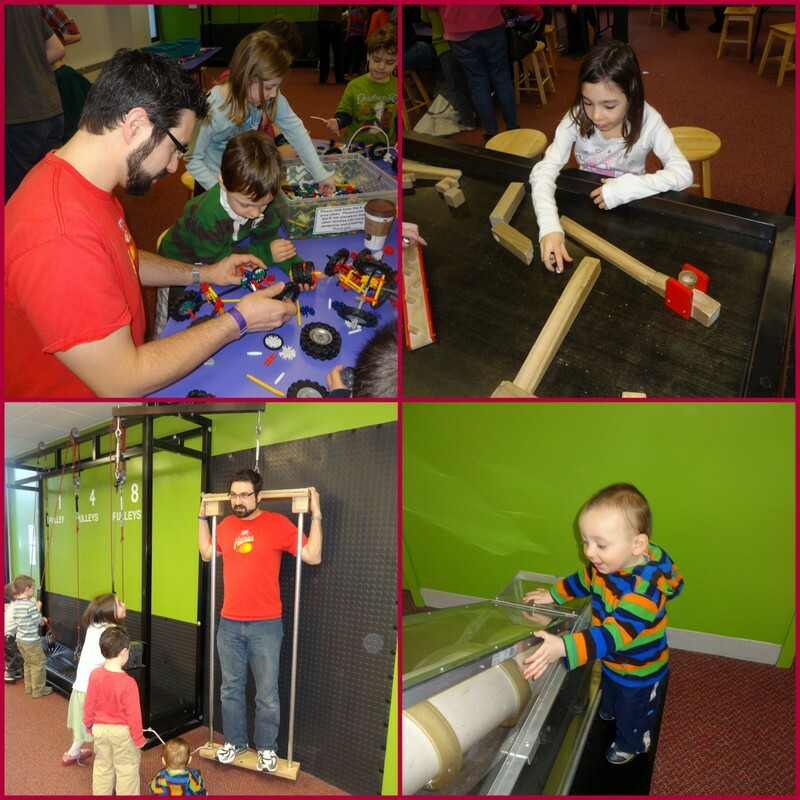 I’m linking up with Collage Friday, The Weekly Wrap-Up, and It’s a Wrap! The Game of Silence picks up Omakayas’ story about two years later. A group of raggedy distant relatives of Omakayas’ people arrive on her island, having fled their homes after enemy attacks. Besides the personal horrors these people have suffered, they bring bad news that the white men intend to drive the Ojibwe people from their island home. A group of men are sent out in all directions to find out the truth and the cause of this situation. This sense of imminent change hangs in the background of The Game of Silence, yet the rhythm of the story is still the seasons in one year of Omakayas’ life as she grows and matures. Miss M could totally relate to Omakayas’ frequent annoyance with her younger brother Pinch (we know all about annoying younger brothers in this house!). I could completely relate with Omakayas as she tries to impress her family by going out to start the rice harvesting early, yet having her plan go all wrong as she gets in trouble for starting too soon, and her already-prideful cousin Two Strike get glory and attention for her hunting success. The title of the book comes from a game the grown ups ask the children to play when they must have an important discussion. One of the elders sings a song, and all the children know they must be quiet, and prizes are given out to the children who can remain quiet the longest (isn’t that a good idea?). As the book closes, a year of “silence” of another sort ends as few of the scouts sent out return, and those that do return, do so with bad news — there is to be no changing the minds of the government. Omakayas and her people must leave their beloved island home. The Game of Silence ends with Omakayas’ family leaving their home in search of a new place to call home, and the story picks up not much later in The Porcupine Year as they are still on their long journey that will take them to northern Minnesota. The journey to what will hopefully become a new home near Lake of the Woods starts out well enough, but takes a turn toward adversity as their trust is betrayed and many of their possessions and food stores are stolen. Omakays and her family have to endure a cold winter without the many things they had collected for their journey. While I usually read to Miss M at bed time, our eagerness to continue the story found us reading on a Saturday afternoon last weekend. Mr. E eagerly joined us and loved the funny little boy Quill with the pet porcupine that rides on his head. While Mr. E didn’t end up listening to the whole book with us, he sat in on most of it (joining us after a quick picture book read with daddy). Mr E told us that he’s liking longer books more now…especially ones with “lots of adventures”. 🙂 I think he’ll be joining us for more bedtime stories in the near future. Especially when taken as a group, these two books along with The Birchbark House are my favorite read alouds so far this school year. Erdrich has created such a wonderful, compelling character in Omakays and it is evidence of her great ability as a writer that she has had me both crying and laughing as I read them aloud. The next book in the series, Chickadee, jumps much further forward to Omakayas as a mother of twin boys who are the focus of the fourth book. I don’t think I’m quite ready for Omakayas to grow up in my mind. I think I’ll linger on these pleasant thoughts of her as a maturing young girl a bit longer…but I’ll definitely have Chickadee on hand for the time when we are ready to continue her story. This unit in our American history studies covered the years from 1783-1815. There are several major topics in this time period, including the forming of our nation’s government, the writing of the constitution, the Louisiana purchase, the explorations of Lewis and Clark and the War of 1812. As in our earlier units we used a book by the Maestros (A New Nation) to give us an overview of this time period. 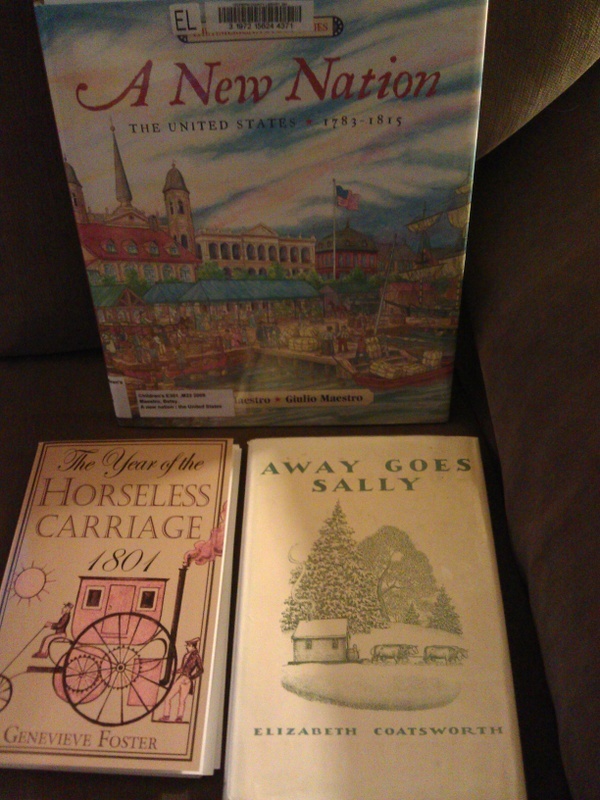 I also read aloud Year of the Horseless Carriage 1801 by Genevieve Foster. You can read my thoughts on that book here. While some of it was overlap with A New Nation, most of it was pretty complementary. Not including Christmas break, we spent six weeks on this unit. This was the first unit for which I actually under-estimated the time it would take us. When I did my planning for the year I thought there would not be very many topics to cover and I only planned four weeks. The “Caroline” American Girl books — Caroline is the newest historical American Girl, and she lives during the time of the War of 1812. Miss M got the first book in the Caroline series for Christmas, and read all six books in the series of her own volition over Christmas break. The Cabin Faced West by Jean Fritz — I think this was Miss M’s favorite of her assigned fiction reading for this time period. The Story of Eli Whitney by Jean Lee Latham — I thought Miss M would like this because she generally likes stories about inventors…but this one, not so much. It was a challenge for her to get through this assigned reading. While I normally don’t really push her to read things she doesn’t care for, I do it every now and then just because I think it’s a good discipline for her to learn for the future. Our book basket of picture book fiction and and non-fiction was a bit lighter for this unit than for some previous units. My US History Year One spreadsheet lists a number of the titles — at least the ones I planned on getting ahead of time. 🙂 I also found a number of picture books for this time period on the shelves at the library — including more titles about the constitution, our country’s early presidents, and the Lewis and Clark expedition. We spent about six weeks on our study of the Revolutionary War. This was two weeks less than what I had originally planned, and since our previous units took less time than expected, this continued to put us ahead of schedule for our history studies for the year. Our key text that gave us an overview of the Revolutionary War was “Liberty or Death” by the Maestros. I’ve mentioned this series of picture books in a variety of other posts. 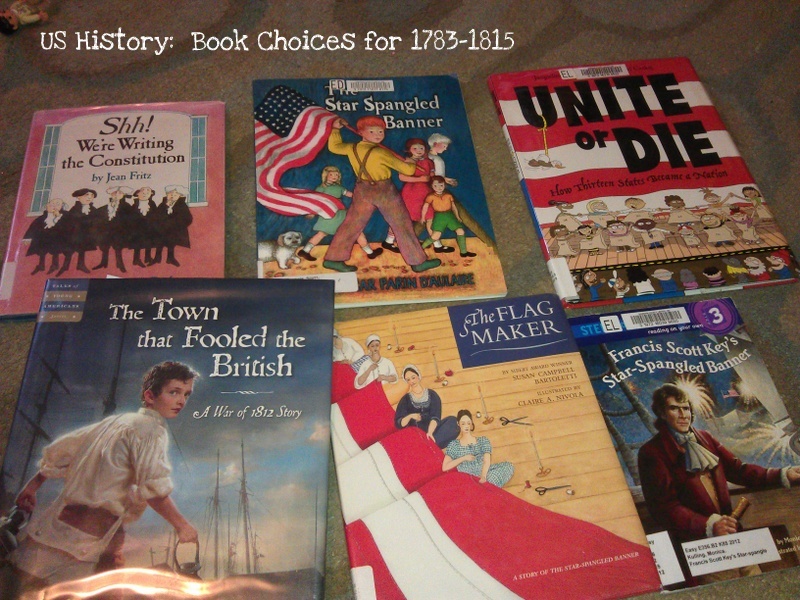 We loved these books and wish the author would write more to continue the story of American History beyond 1815 when the last book ends. I also read most of “If You Were There in 1776” by Barbara Brenner aloud. It’s a very interesting book about daily life during that time period. We filled our history library basket (well, it’s really a crate!) absolutely full with about 30 picture book fiction and non-fiction titles. I read a few aloud to Miss M and the boys, but Miss M read many of them independently. There’s a somewhat complete list in my updated US History Year 1 spreadsheet. A problem with doing this recap close two months after the fact is that I can’t remember a lot of details about which picture books we really liked! 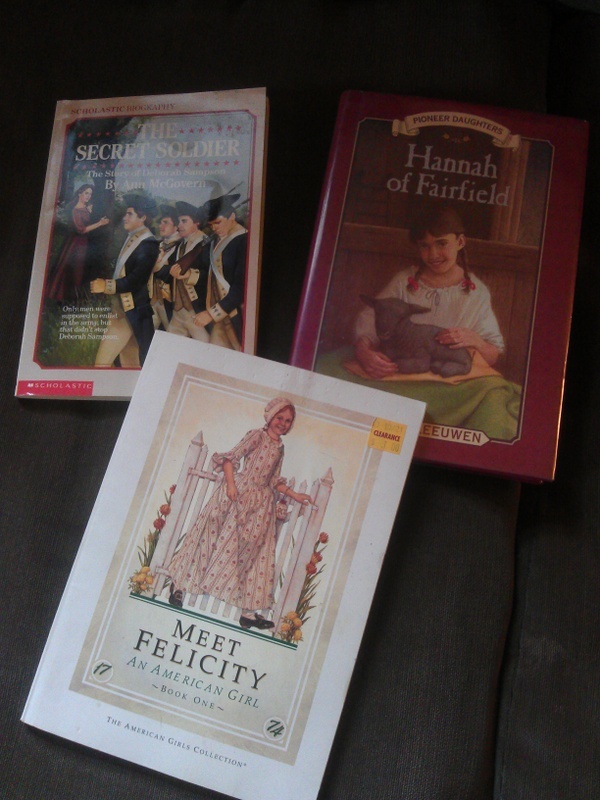 Miss M showed less interest as the school year went on in crafty projects related to history, so I haven’t pushed it. We’re also not doing much written work this year — just oral narrations or discussions of books we’re reading. And I’m really okay with that for 3rd grade history. Next time around Miss M will be in middle school — a perfect time for additional written projects! We did start watching episodes of the TV show “Liberty’s Kids”. This animated series does a great job telling about major events of the Revolutionary War through the eyes of a few fictional characters. The entire series is available to watch on YouTube, or as the saying goes, “check your local listings” — one station available to us over-the-air (we don’t have cable) is showing two episodes per week and we have been recording them. We’ve continued to slowly watch the episodes well after we finished up with this time period in our history studies. There are 40 episodes, and we have sometimes gone weeks without even watching one…so we’re only up to about episode 20.